Exporting to psd, single and double spread, for pdf? Apologies if this ends up being an Adobe Acrobat question. But is there something else I can do from CSP? I am entering a competition that requires a PDF submission. I finished inking a 20 page story in CSP story. I want to export to PSD. I will flat in CSP but color in PS then I will make a PDF from PS. 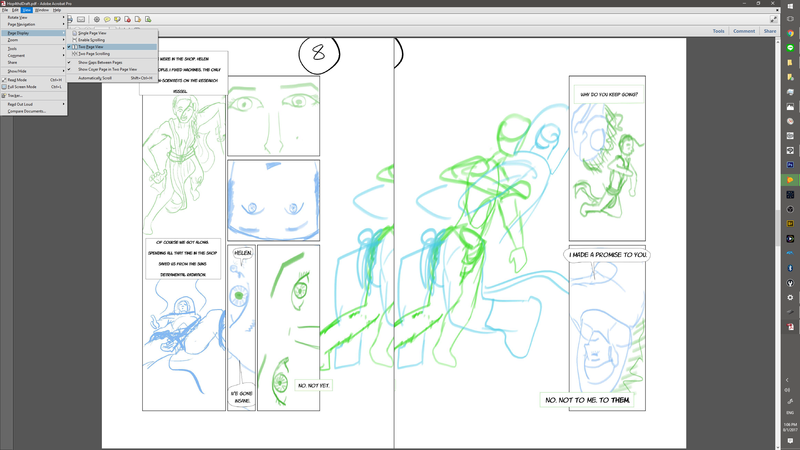 I am not sure the best way to have the end PDF with a single cover, then view 2 pages, but when have a double page spread show on it's own instead of a double page spread show with the next page that should not show yet. I have tried exporting the double page spreads individually and in Adobe Acrobat I can crop the two images so they show with out a gutter in the middle. But there is a line down the middle. I would prefer to export spread separately especially to color. Any ideas? One thing I thought about doing, was making all my pages double spreads, but adding a gap for the single pages getting grouped. But when I go to story/combine pages, it shuffles things around funny. And I don't want to work on double page spreads in PS unless I have to. It is just a pain moving the odd sized page around compared to the skinnier single page. But I might be up for it if that is my best chance. It was suggested to use InDesign in the adobe forum to make all the single pages into spreads and use single page view. I will try that out. Whether you are going to use export spread separately or not depends on whether or not you will print the comic. 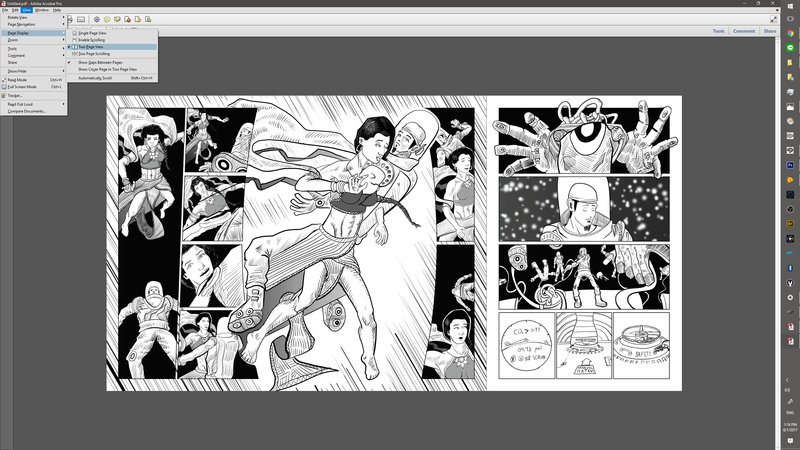 If the comic is to be printed, the spread needs to go on two separate pages. If it will be viewed digitally, then you want the spread exported as one "page". When creating your PDF just add your pages as is. 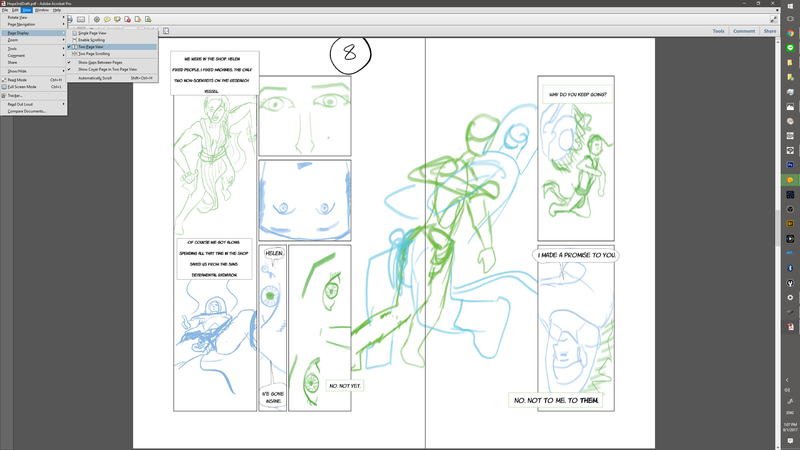 One page in your page layout program equals one page of comic. The double page spread would be one page even though in a printed book it would count as two.